The Rebel Sweetheart. : Dearfoams | Comfort Guaranteed. So you've had a long, hard day at work, pacing around the office doing this and that. All that skittering and skedaddling is tiring as it is, what more if you're wearing high heels or pointy-toed shoes? At the end of the day, wouldn't it be nice to kick those stilettos away and slip into something more comfortable instead? Enter Dearfoams, a line of accessory footwear, slippers and sleepwear products that combine style with comfort. Dearfoams are quite popular in the United States, and are known for the comfort that their footwear provide. With the soft and snug fabric plus the extra cushioning added, it can't be any more comfortable than that. 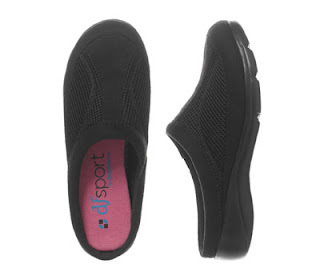 Take for instance the DF Sport Clog, a popular style amongst Dearfoams fans. Its mesh and jersey upper allows your feet to 'breathe'; its sole - made with rubber and EVA - is light, flexible, and cradles the feet while alleviating pressure. I'm not the biggest fan of clogs, but my Mum is. These are the kind of footwear she'd slip into and wear at home, after spending 10 plus hours at the hospital, doing the patient rounds, strutting from one ward to another, moving from one floor to the next. Come to think of it, if her hospital would allow, she'd probably wear the white clogs to work, too. It's a good thing the Dearfoams website ships outside of the US, or she could just buy several pairs when she flies to Florida in June. You are A very good product review specialist.Again a nice product review from you. This would really help the foot relax after a long day of walking/running and working. This looks promising, I have been looking for something comfortable I can wear after a long hard day at work. I prefer this kind of clogs too. Easy to wear because it is slip on. And comfortable for long walks. style is elegant too! I'm gonna check out the website. Sounds interesting. I'm gonna visit the site later. It sounds really interesting.